Here are a few freshmen in their pajamas and pots working their way around the bonfire. Here is a shot of the 1939 Chapel Sing with members of the freshman class on the steps of the Pioneer Chapel. The upperclassmen, probably members of the Senior Council, are closely watching for the least mistake. Unlike the Chapel Sing of today, in this era and for decades after, all freshmen took part and it was every man for himself. Lastly, here is a great picture of the Lambda Chi house all decked out for Homecoming 1939. Enjoy the week and enjoy the game on Saturday!! As the campus gears up for Homecoming 2009, I thought it might be fun to look as some old images of this celebration…The poster above was for the homecoming celebration of 1937. It is interesting to note that this was the Monon Bell game. I also note that no speeches and no programs were to take place! However there was lunch, then the game, then a meeting of “W” men or men who had won athletic letters. All of that fun and, just as now, there was a Homecoming Concert free to the public. This is just a great old poster filled with loads of energy! This photo shows the homecoming bonfire built by the Class of 1925. It was the chore of each freshman class to build a bonfire and protect it from the sophomore class. These bonfires were built of anything the marauding freshmen could find and drag back to campus. As seen in the photograph above, an outhouse was the preferred topper for a really good bonfire. I have always wondered what the neighbors thought at this time of year. Were they out in their backyards standing guard? As we are moving things around, we are encountering any number of interesting items. These films of 1928 are excellent examples of a couple of such items. These 16mm films have been kept in the Archives and, while neat to look at as artifacts, it is their content that is of real interest. A casual chat with Adam Bowen in the Media Center about how neat it would be to be able to see these movies. Adam placed a campus classified ad asking for a 16mm projector and Jamie Ross in IT found one in a closet in Baxter Hall. Better yet, it was in perfect working order. Adam projected the movie on to a blank background for filming with a digital video camera. He called me over and for the first time ever I saw the old history move!! Right there on screen was President Hopkins, Dean George Kendall, Doc Howell and tons of others. I saw the freshman class practicing their spirit yells. I watched the football team play, including some pretty good kick-offs. All of these combined with that now rare, but easily remembered, sound a film projector makes as it plays, click, click, click…IT WAS SO COOL!!! We will have the silent film running in the Lilly Library over Homecoming if you would like to see a little about life at Wabash in 1928. There are scenes of golf at the Country Club, football, tennis in the arboretum, Chapel, faculty members, fraternities of that era – including a very young Byron Trippet – the old FIJI house when it was new, same for the old Kappa Sigma house. This film is really just a wonderful little window on Wabash in the late 1920’s. Update: You can find some of these clips on You Tube. Adam Bowen posted them. 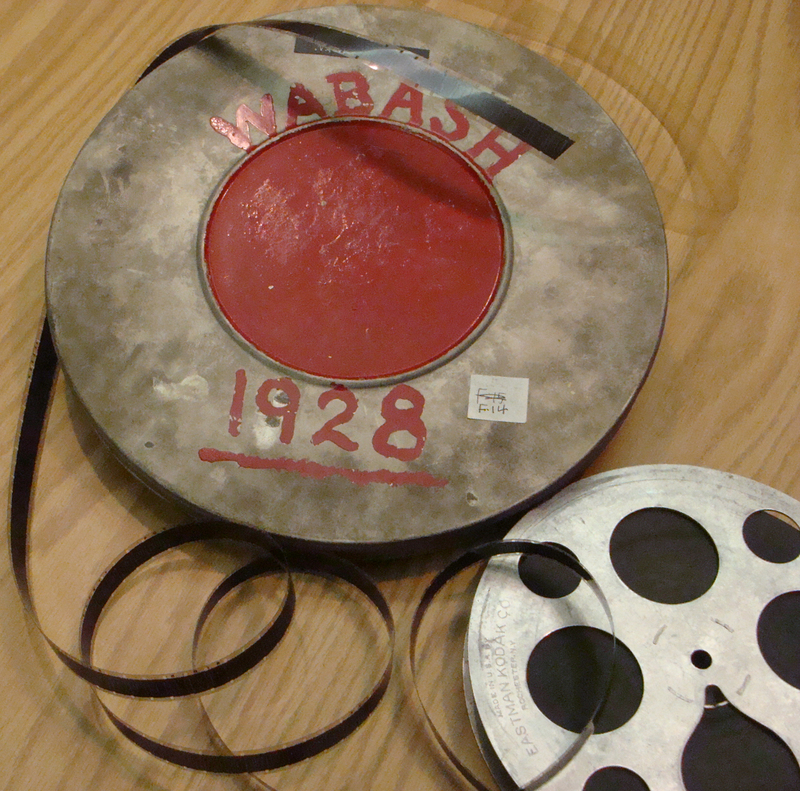 Search Wabash College+1928s and you will find them. Many thanks to Adam for his tech savvy!!! It was the fall of 1912 and the Wabash team was back on the field after a longer than usual break from football. The tragic death of a Wabash football player the year before had forced the cancellation of the remainder of the 1911 season. Ralph Lee Wilson’s story continues to inspire Wabash men yet today. As you might imagine, it was quite a blow to the school and yet the team was ready to get back to playing football. 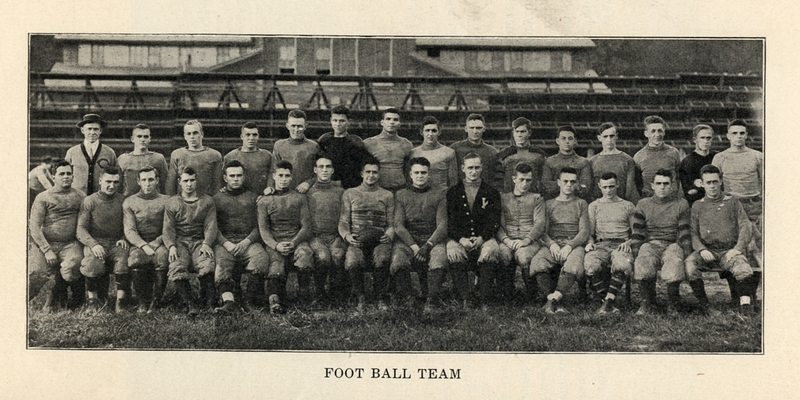 The team of 1912 was coached by Jesse Harper, in the picture below far left, back row. Harper left Wabash later for Notre Dame where he created a football dynasty with his use of the innovative forward pass. Two books have recently been published about Harper that pull extensively from Wabash archival sources. Doc served as the class president, was a member of the Phi Gamma Delta fraternity and, as the oldest of eight sons, worked his way through college doing odd jobs. Upon graduation, Doc attended Pharmacy School and became a pharmacist and drug store owner like his father. For 20 years Doc was a Class Agent keeping his classmates in touch with Wabash. In a letter to the College, his daughter said that next to his wife, Doc loved Wabash best.